So I was recently handed a box so bright orange that I could wrap it around my body as a safety device while jogging in the early evening, and I had no idea what was in it or what to expect. That, it turns out, is sort of the point. 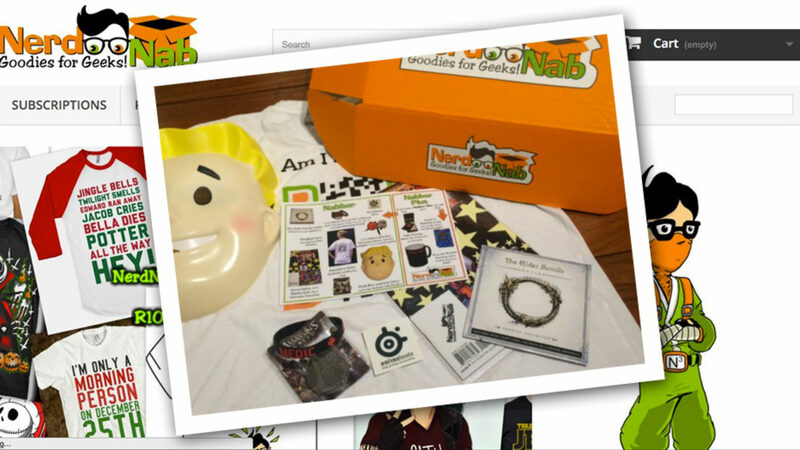 This box was from the folks over at Nerd Nab, a new South African local outfit that is looking to fill your life with goodies thanks to a monthly mystery box of awesome fun and geeky things. It’s a concept that I am to believe is not entirely new, but it is new to me and despite various similar concept existing, it really seems to be all down to how its approached and what you are looking to get out of it. A quick chat with Nerd Nab’s fearless leader Brian Murdoch, and you quickly come to realise that this service is being powered by a complete passion for all things fun and a true love for the concept of sharing these joys with other people. It was heartwarming as much as it was reassuring of the fact that the people behind are in it for all the right reasons. So what the hell is it exactly? If you, like me, have never really toyed with this sort of idea, then let me put it simply. The “Goodie Gather” goes out and finds all sorts of fun and interesting things to pack into a box, and then they ship it off to you every month. We got the October box which had been lightly themed towards Halloween and also draws from the cool promo items and goodies surrounding video game releases for the time. Our box had a bunch of items including a Fallout Vault Boy mask, a Halloween LED lawn ornament/spike, a sweet metal Assassin’s Creed keyring and some other goodies like some Elder Scrolls Online soundtrack selections on a disc, T-shirt, Evolve wristband, Steelseries Tattoo and Harley Quinn comic. The Nabber Plus is a prize that is awarded to 10 lucky subscribers, on the condition that they have bought a bundle pack of 3 boxes, and for this specific month included a COD: Black Ops branded power pack, Evolve mug and Rabbids Pack. That however, is nothing to the possibility of being the winner of a monthly “The Motherload” prize box, which will have you smiling from ear to ear like the lucky subscriber who found themselves the owner of Steelseries Gaming Headphones, Black Ops III KontrolFreek thumbstick covers, a friggin Mad Max Leather Jacket (the one from the game AND a 50th Anniversary Thunderbirds board game. It’s worth over R5000… Good grief, why didn’t they give me THAT one to check out, eh!? People who work in the gaming industry and/or attend a lot of press events often get access to a lot of these cool little goodies, either to give one away or just to as a little corporate promo item, but for the everyday person its much harder to get your hands on a lot of these goodies, so it’s a nice way of opening yourself up to the great little geeky things doing the rounds out there. Nerd Nab are only looking to make each box better and better, and from the enthusiasm experienced when I chatted with them, I personally believe that they are going to do everything they can to achieve just that. The truth is, you never know what you are going to get and that’s the fun of it, and while I’m sure that there will be some months that don’t quite do it for you, others could. I’m sure that many people didn’t think too much about the Halloween light spike/ornament, but as someone who collects lots of Halloween items for our annual Halloween party, I was pretty thrilled. So why the article title? Well because I think if you’re running into close to Christmas and you wanna get someone something but aren’t sure what to get or have run out of time, this seems like a pretty sweet way to hook a buddy or geeky family member up with a subscription or something to get them started. While you’re at it, hook yourself up in the process if you think this could add value to your hobby, but I need not elaborate further for fear that this might start sounding more like an advertorial than an article. Let us know if you like the idea or already signed up to this or something similar and how its working out for you!